Quinoa (makes about 4 cups) - This is the BEST way to make it (via Goop)! 1. Add the quinoa to a fine mesh strainer and rinse it for about a minute. Add the quinoa, water, and salt to a medium pot that is set over medium-high heat. Cover and bring to a boil. Reduce the heat to low and simmer for about 12-13 minutes, or until the water has completely evaporated. 2. Turn off the heat. Remove the lid to the pot and place a dry paper towel over the pot. Cover (i.e. place the lid over the paper towel) and let it sit for 5 minutes. Then fluff the quinoa lightly with a fork. The paper towel method makes the texture of the quinoa really tender and moist. Don't skip that part! 1. 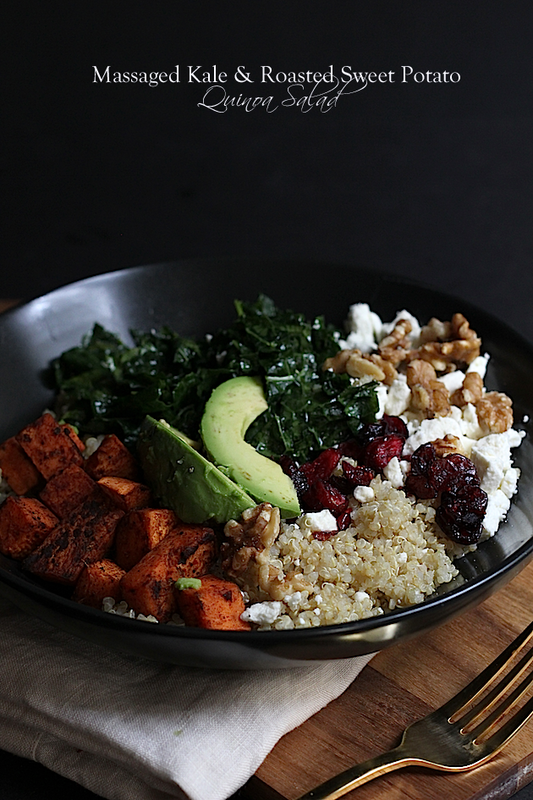 Add the chopped kale to a large bowl and set aside. 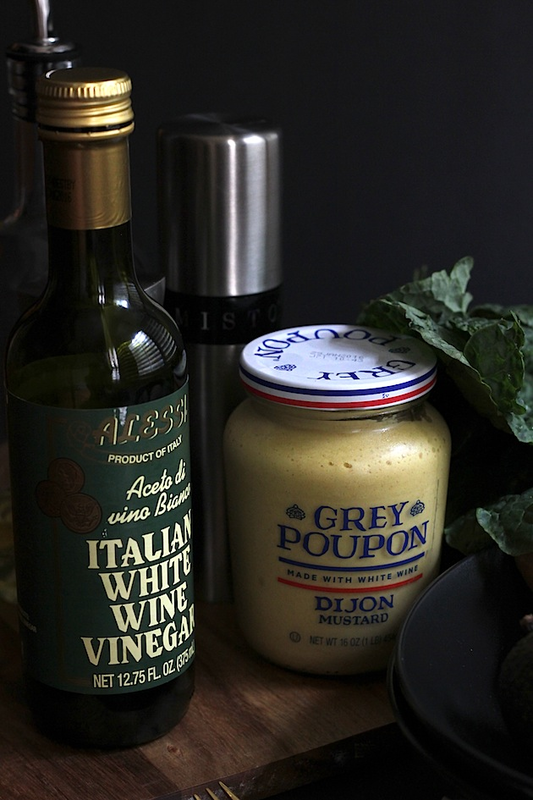 Add the olive oil, white wine vinegar, mustard, lemon juice, salt, and pepper to a small bowl. Whisk the ingredients until they are completely combined. 2. Pour a little over half of the dressing over the kale and massage the kale until it has wilted. To massage the kale, simply grab a handful of the kale in one hand and squeeze and move it around in your hand. Keep doing this until all of the kale has wilted. Use the remaining dressing for the salad if desired. 3. Place the bowl of kale in the refrigerator and let it marinate for about 15 minutes or so. 1. Preheat the oven to 400 degrees. Add all of the ingredients to a sheet pan lined with parchment paper or to a 10in cast iron skillet (my preferred method). 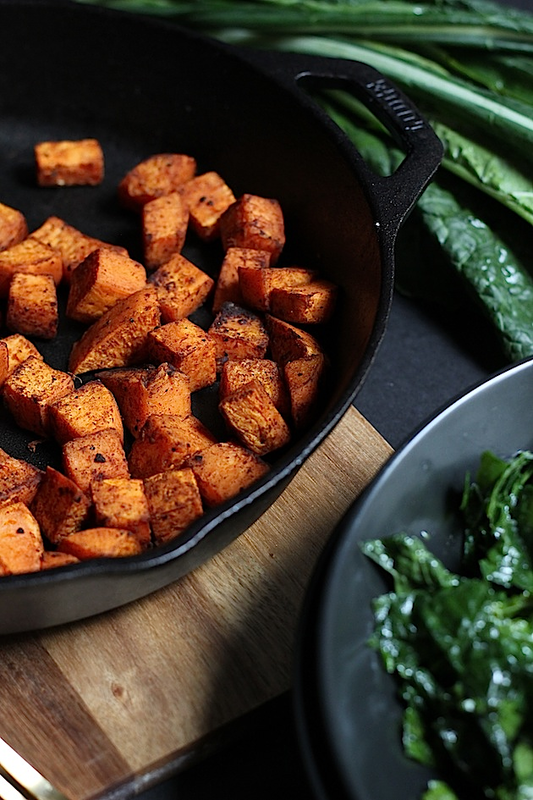 I love the crust that the iron skillet creates on the sweet potatoes! Toss the sweet potatoes around to make sure everything is evenly coated. 2. Bake for about 25 minutes or until the sweet potatoes are tender. If you use a sheet pan, toss them around after about 15 minutes for even cooking. 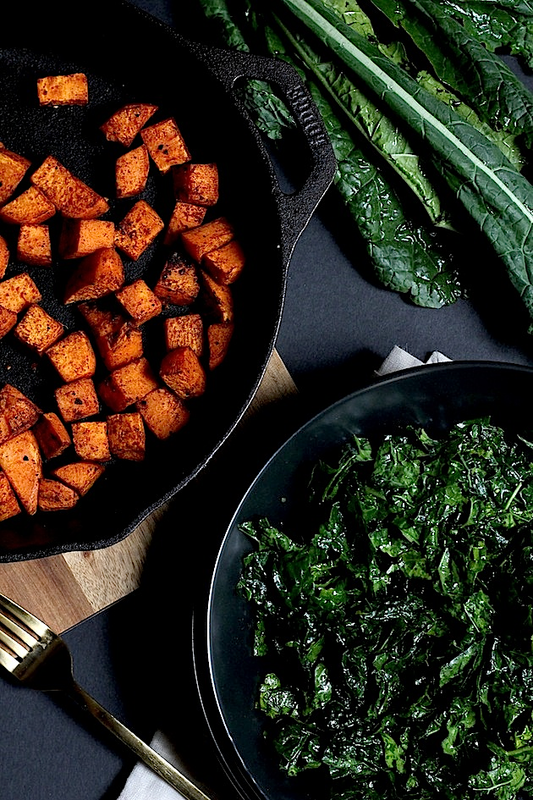 If using a cast iron skillet, I toss them around a few times to make sure they don't cook too fast on one side. 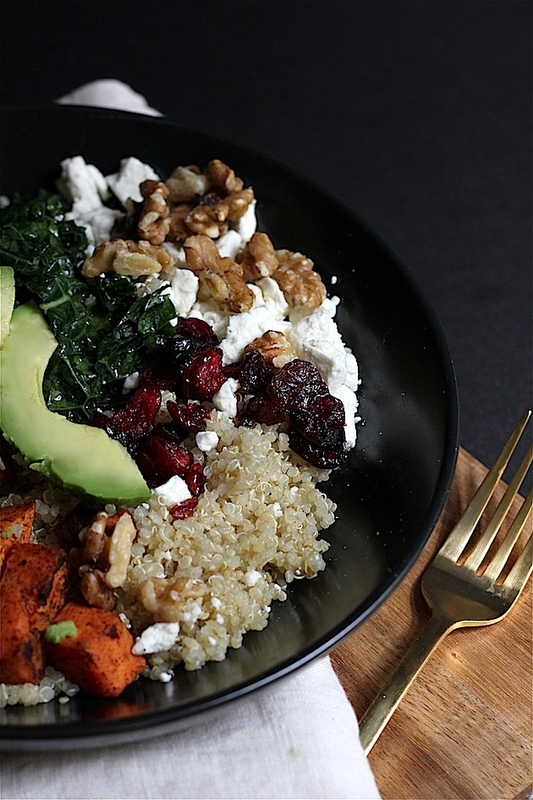 To make the salad, simply combine all of the ingredients in a bowl and toss! Enjoy!